Mr. Ky. Baseball: Where are they now? 2010: J. T. Riddle (Western Hills) — Riddle has signed to play college ball at the University of Kentucky in 2011 and was drafted by the Boston Red Sox in the 35th round of the 2010 MLB draft. 2009: Luke Maile (Covington Catholic) — Maile is a rising sophomore at UK and was 7-25 with three home runs and six RBI in limited action as a freshman. 2008: Zack Cox (Pleasure Ridge Park) — Spent 2010 as a sophomore at Arkansas where he was named an All-American by several outlets after batting .429. Cox was the first-round pick of the St. Louis Cardinals in the 2010 MLB draft. 2007: Ben Revere (Lexington Catholic) — Revere was the Minnesota Twins’ first round pick in 2007 and has done nothing but hit in his Minor League career. Revere is currently batting .307 with 21 stolen bases for the AA New Britain Rock Cats and was named the fifth best prospect in the Twins’ system by Baseball America prior to the 2010 season. 2006: Nathan Adcock (North Hardin) — After three and one-half mediocre season in the Seattle Mariners’ organization Adcock was traded to the Pittsburgh Pirates in 2009 as part of the Jack Wilson trade. Adcock is having his best season to date in 2010 for the high A Bradenton Marauders where he is 6-2 with a 2.99 ERA in 13 starts. 2005: Chaz Roe (Lafayette) — Roe was the Colorado Rockies’ first-supplemental round pick in the 2005 MLB draft and has worked his way through the Minor Leagues to AAA. Last year was Roe’s best season to date when he went 7-3 with a 3.15 ERA for AA Tulsa, but he has struggled so far in 2010 to the tune of a 5-7 record and 5.86 ERA in hitter-friendly AAA Colorado Springs. 2004: Collin Cowgill (Henry Clay) — Cowgill was a standout in his four seasons at UK and has continued to excel in professional baseball after the Arizona Diamondbacks took him with their fifth-round pick in 2008. Named the ninth best prospect in the D’Backs farm system by Baseball America prior to the 2010 season, Cowgill is batting .280 with five home runs and 43 RBI for AA Mobile this season. 2003: Josh Ellis (Paul Laurence Dunbar) — While older brother A.J. Ellis has carved a niche for himself as the Los Angeles Dodgers’ backup catcher this season, Josh is still working his way through the Diamobacks system after the team selected him in the 11th round of the 2007 draft. Ellis is 1-0 with a 2.86 ERA in 18 relief appearances between AAA Reno and AA Mobile this season. 2002: Brad Corley (Pleasure Ridge Park) — Corley was the Pirates second-round pick as an outfielder in 2005 and was named the tenth best prospect in the team’s system by Baseball America entering the 2008 season. Corely’s career stalled after that honor. and he hasn’t advanced past AA since. He was acquired by Colorado in 2009 and is currently playing for short-season Tri-City as he attempts to become a full-time pitcher. 2001: Jeremy Sowers (Ballard) — Sowers was the Indian’s first-round pick in 2004 out of Vanderbilt University and has appeared in 72 games over parts of four season with the Indians. Sowers is 18-30 as a MLB starting pitcher, and he is currently struggling to the tune of a 1-4 record and 6.49 ERA as a left-handed reliever for AAA Columbus. 2000: Spencer Graeter (Ballard) — Greater batted .307 with 14 home runs and 98 RBI in four seasons for UK from 2001-2004 but never appeared in affiliated ball. 1999: Joe Blanton (Franklin-Simpson) — Blanton has appeared in two World Series and even earned a victory in game four of the Philadelphia Phillies World Series win in 2008. Blanton is just 2-5 with a 6.96 ERA in eight starts for Philadelphia this season, but is 65-59 with a 4.34 ERA in seven MLB seasons with the Oakland Athletics and Phillies. 1998: Austin Kearns (Lafayette) — Kearns won a job as a reserve outfielder with the Cleveland Indians in Spring Training and has worked his way into a starting role. On the season Kearns is batting .288 with seven home runs an 32 RBI. 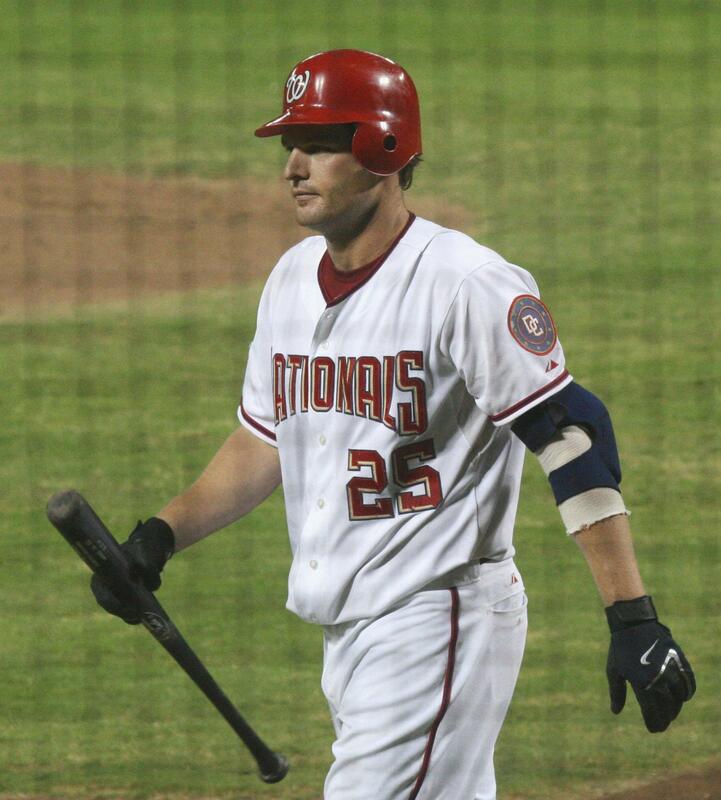 In nine MLB seasons, Kearns has batted .258 with 112 home runs and 454 RBI with the Cincinnati Reds, Washington Nationals and Indians. 1997: Scott Hodges (Henry Clay) — Hodges was the Montreal Expos’ first-round pick in 1997 and spent nine seasons in the Minor Leagues appearing as high as AAA. In 2005 he was diagnosed with lymphoma, ending his career. 1996: Aaron McGlone (Greenup Co.) — McGlone batted .345 with eight home runs and 51 RBI for UK in 2000, but never appeared in affiliated ball. 1995: Brad Wilkerson (Apollo) — Wilkerson spent parts of eights season in the Major Leagues, batting .247 with 122 home runs and 399 RBI for the Expos, Washington Nationals, Texas Rangers, Seattle Mariners and Toronto Blue Jays. He retired in 2008 before briefly making a comeback with the Phillies during Spring Training this season only to announce his retirement for good. 1994: Scott Downs (Pleasure Ridge Park) — Downs was the Chicago Cubs’ third-round pick in 1997 out of UK, and has spent parts of ten season in the big leagues. Over the past four seasons he has carved out a niche as one of the best left-handed relievers in baseball with the Toronto Blue Jays. In 2010 he is 2-5 with a 3.34 ERA in 34 games for the Blue Jays. 1993: Dion Newby (Harrison Co.) — Newby played collegiately at North Alabama but never appeared in affiliated ball. 1992: Shon Walker (Harrison Co.) — Walker was the Pirates first-round pick in 1992 and last appeared in affiliated ball in 1998 at High A Lynchburg. 1991: Trever Miller (Trinity) — Miller’s long Major League career is still going strong as a left-handed reliever in the St. Louis Cardinals’ bullpen. Miller is 0-1 with a 3.12 ERA in 25 games for the Cardinals this season and is 18-16 with a 4.17 ERA over 12 MLB seasons. Miller was the Detroit Tigers’ first-round pick in 1991. 1990: Darren Burton (Pulaski Co.) — Burton was the Royals’ fifth-round pick in 1990 and last appeared in affiliated ball at AA Altoona in 2001. He spent parts of six seasons in AAA. 1989: Tab Brown (St. Xavier) — Brown was drafted by the Atlanta Braves in 1989 and spent at least two seasons in the Braves’ organization.